competences through collaborative tasks and/or project work. Telecollaboration is rooted in Task-Based Language Teaching (TBLT) and Project-Based Language Teaching (PBLT) respectively. Acquisition (SLA) and teaching methodology courses in both institutions. Implementation initially followed the design constructed by the Israeli researcher, Dr. Tina Waldman, in an earlier project between Israeli and American students (Waldman & Harel, 2015), and more recently adapts the design of the Erasmus+ Evaluate project. Telecollaboration 2.0 reflects the overall notion of our own approach to telecollaborative work in higher education over the last years and different attempts - not always successful - to implement this methodology in our own teaching bridging the gap between different cultures, languages and walks of life. The term Telecollaboration 2.0 was first coined by Guth & Helm (2010) and reflects the basic idea of our own endeveaur in the field. In their words "the concept of Telecollaboration 2.0 [...] does not mark a radical break from the practice of telecollaboration, which has always exploited the social-relational aspects of the Web, but rather it expands on 'traditional' theories and practices of telecollaboration by introducing new issues and approaches as well as the new tools and opportunities for collaboration and exchange as offered by Web 2.0" (Guth & Hirth 2010, 16). So far we have conducted three exchanges between Israeli and German student teachers of English as an International Language (EIL) at either primary or secondary level: winter term 2015 - winter term 2017/2018. The latter was conducted in cooperation with the large-scale Erasmus+ project Evaluate, coordinated by Prof. Robert O'Dowd (University of Léon, Spain). Our telcollaborations include three stages: information exchange, comparison, and collaboration. Information exchange about personal details and aspects of home culture takes place at the beginning of the process so the students can get to know each other, build trust and team spirit. 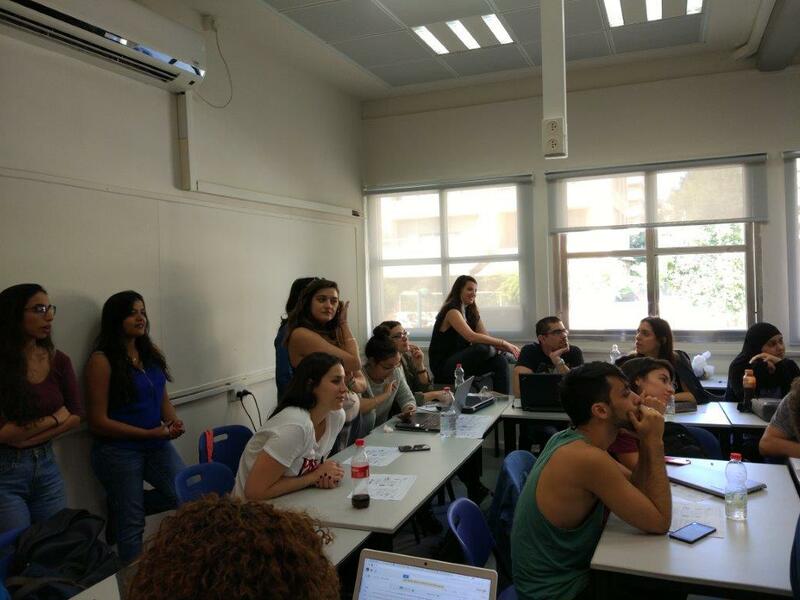 Over the following weeks, student teams comprising Israeli and German students compare and contrast teaching and learning EIL in both regions. Finally, the teams work collaboratively on developing an intercultural language focused unit targeted at prospective pupils. Our aims are to make trainee teachers of EIL collaborate online to promote their intercultural, methodological and linguistic competences through experiential learning. This includes first-hand experience of intercultural exchange and international team work. Thus, prospective teachers learn to use innovative technology and digital tools as well as gaining competences of intercultural collaboration and intercultural proficiency as they systematically collaborate with their fellow students to achieve a common goal, an intercultural teaching unit that can be taught at their respective schools. All Participants are pre-service teachers of English as an International Language (EIL) studying at a teacher training college in Israel or a university of Education in Germany. Both groups use English as lingua franca and are between B2 and C1 level of the CEFR. The German groups comprise B.A. students between 19 and 27 years of age who are going to become teachers either at primary of secondary level (Sekundarstufe I). There are number of students with a migrant background, usually Muslims, and the majority of students can be considered middle-class. Participants from Israel are student teachers of English in the third year of their Bachelor of Education (B.Ed.) programme They range in age from 19 – 30, have diverse religions – Jewish, Muslim, Christian and speak various home languages– Hebrew, Arab, Russian. Around 10% of participants in each round are male. The participants reside all over Israel although the college, which is the largest teacher training college in the country is in Tel Aviv. The purpose of this ongoing study is to provide future EIL teachers with an apprenticeship of learning ways that innovative technology can be used to transcend classroom walls for virtual mobility and intercultural communication. Therefore, students work together in international teams in order to achieve a common task objective as well as getting to know people from different cultural backgrounds. Participants are trained to understand and make intensive use of technological and methodological appropriate digital tools such as bilateral online collaboration and web based project work. The telecollaboration brings together students of EIL as prospective teachers, social agents and societal multipliers, and fosters pluricultural and plurilingual proficiency. It specifcally intends to determine how such an apprenticeship can strengthen student teachers’ belief in their ability to implement telecollaboration in their own teaching. Data for the study is gathered through a pre-post quantitative survey as well as student reflections. The findings indicate that telecollaboration experience integrated into teacher training can raise students’ perceived self-efficacy to implement telecollaborative exchange projects into their future teaching. Firstly, the students meet in a whole class synchoronous videoconference using video conferencing software. The participants discuss their career choice of becoming EIL teachers; the status of bilingualism and multiculturalism in their respective countries and educational systems, as well as student life. Secondly, students team up in groups of 2-3 people from each country and get to know each other. Using collaborative tools such as Padlet, they create team names, and a working philosophy. Teams then meet regularly to work on their joint EIL task based project using synchronous tools including the Moodle video conferencing tool, Unicko , as well as other tools such as WhatsApp. They also work on asynchronous tools such as Padlet and and Google Docs. Before finalization, teams provide peer review of each others' projects. Analysis of qualitative and quantitative research data collected from 100 participants shows that participation in the telecollaboration has empowered them to learn together, share difficulties and successes and produce joint products that acknowledge diversity. It has helped them to develop culture-sensitive pedagogy that meets needs associated with cultural differences. Additionally, through experiential learning their self-efficacy is raised in terms of creating and implementing intercultural telecollaborations with their prospective pupils.